Genned Expandable Garden Hose. 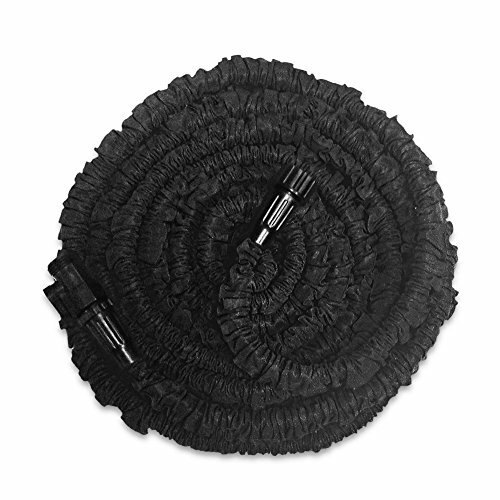 This expandable garden hose is lightweight and flexible and can expand to 3 times its original length when the water is turned on. ☆ The item is shipped form US warehouse. The shipping time may take 3-5 working days. It's very fast ship. Note1: This package does not include a spray nozzle. Note2: For safety reason when you shut off the water, please first switch off the valve on the connector and then the tap! It will prevent the hose from running back and hitting you. Note3: If you find this hose does not extend to 50ft, please kindly make sure whether the faucet is at full blast. At Genned, we back products all with an 18-month warranty and provide friendly, easy-to-reach support. ☆ Extra-Long and Portable ---- A Perfect Length to Do Outdoor Work: Very lightweight,flexible and long enough to make it easy and convenient for watering around the garden, even when full of waterInner rubber washer, no more leaks or cracks! If you have any questions about this product by Genned, contact us by completing and submitting the form below. If you are looking for a specif part number, please include it with your message.